"Next to the water hyacinth is nilubon [beautiful blue tropical day blooming waterlily], covering a 16,000 square meter area; next to nilubon is rattana-ubon [red tropical night blooming waterlily], covering a 16,000 square meter area; next to rattana-ubon is setu-ubon [white tropical night blooming waterlily], covering a 16,000 square meter area; next to setu-ubon is jongkolnee, covering a 16,000 square meter area; next to jongkolnee is bua-dang [probably lotus, colour red], covering a 16,000 square meter area; next to bua-dang is bua-khao [probably lotus, colour red] covering a 16,000 square meter area; next to bua-khao is kamut [tropical day or night blooming white waterlily], covering a 16,000 square meter area; all seven varieties of Nymphaea* look beautiful and fresh . . . "
*Two of these are thought to have been Nelumbo. Two interesting items of information stand out in this. 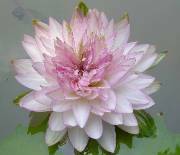 First, it seems to establish that there were at least five waterlilies and two lotuses indigenous to Thailand. 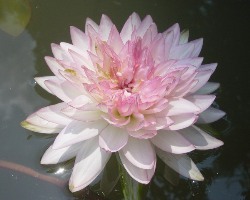 Second, King Ramkhamhaeng was the first documented person who planted Nymphaea and Nelumbo ornamentally in Thailand (then Siam). Thai people know the name 'Jongkolnee' from traditional Thai medicine and ancient poems, but those references never described its botanical and horticultural characteristics. Nevertheless, because we can date this back to "Traiphumi Phraruang", we believe that 'Jongkolnee' originated in Thailand. Today, it is rarely found in the wild, and only in Thailand. This continues to be investigated. 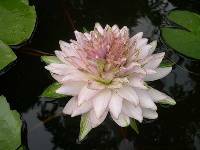 Dr.Slearmlarp Wasuwat, of Pang-u-bon Waterlily Garden, has observed it closely and collected information about it for many years. In 1982, he included it in his book "Culture of Ornamental Nymphaea" (in Thai). In 2000, he offered more complete information concerning Jongkolnee to the International Waterlily and Water Gardening Society, which recognized it and printed its description in the society Journal in 2001-2002. Flowers are fully double and the petals are coloured pale pink or white with pink on the tips, becoming white with traces of green on the last day of blooming. 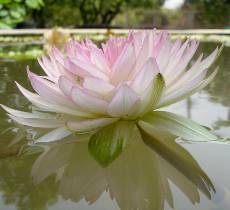 Its extraordinary number of petals and abortive sexual organs are similar to some lotuses. The flower usually blooms for five days. Its bloom closes or partially closes late in the evening only on the first day. From the second day onward it remains open until it fades. 'Jongkolnee's' leaves are cordate and each leaf edge is serrurate. The top of the leaf is green, while the underside is a reddish violet colour. It grows like other tropical waterlilies. 'Jongkolnee' is suitable for growing in medium to high water levels (about 60-80 centimeters depth). It grows best in a large pond outdoors which should have full sun for at least 4-6 hours per day. of the King Rama IX Public Garden, and Dr.Weerachai Na Nakorn, Director of Queen Sirikit Botanic Garden of Thailand, are consulting with the world's plant classification authorities, asking them to study and properly place 'Jongkolnee' in Nymphaeaceae.